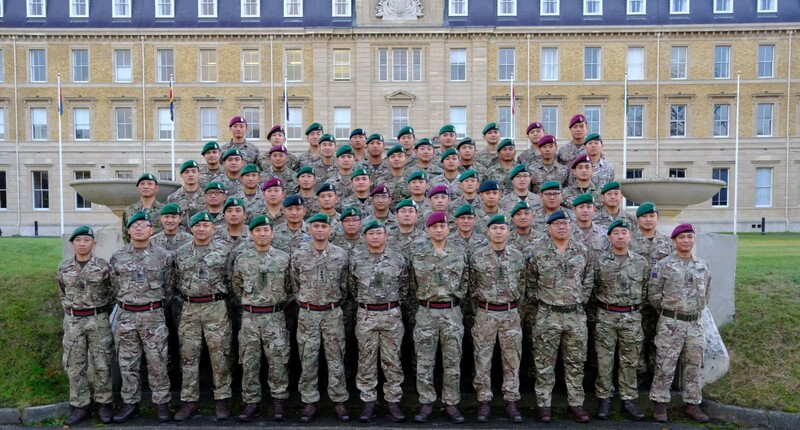 2017 Gurkha Staff and Personnel Support (GSPS) Annual Briefing Day was held at the Royal Military Academy Sandhurst on Friday 24th November 2017 which was followed by a dinner night. It is one of the two important days in the GSPS fraternity’s calender, the other being GSPS Annual Families Day in The Summer, next year’s date being Saturday 12th May 2018. This annual event allows the Officer Commanding GSPS Major Narendra Gurung to bring all GSPS members together from various parts of the country to foster the GSPS ethos, identity and to celebrate the past achievements and to look forward to the challenges ahead. The day was broken down into two parts. First part was targeted at the soldiers and officers receiving updates, briefs and discussions. The second part being the annual dinner night for the Senior Non Commissioned Officers and Officers and attended by our distinguished guests. The annual forum started with Colonel James Robinson, Colonel Brigade of Gurkhas who was delighted to see all present and addressed the GSPS Company members with his encouraging words supporting the strong growth of the GSPS alongside the Brigade of Gurkhas (BG). The Officer Commanding updated the forum and further went on to encourage all to express their views at the discussions later in the day. He laid out the importance of leadership, taking ownership of the GSPS future and to keep on pushing our abilities. Members also took on the task of conducting Tribal Analysis of the GSPS for it to be presented in the next forum. 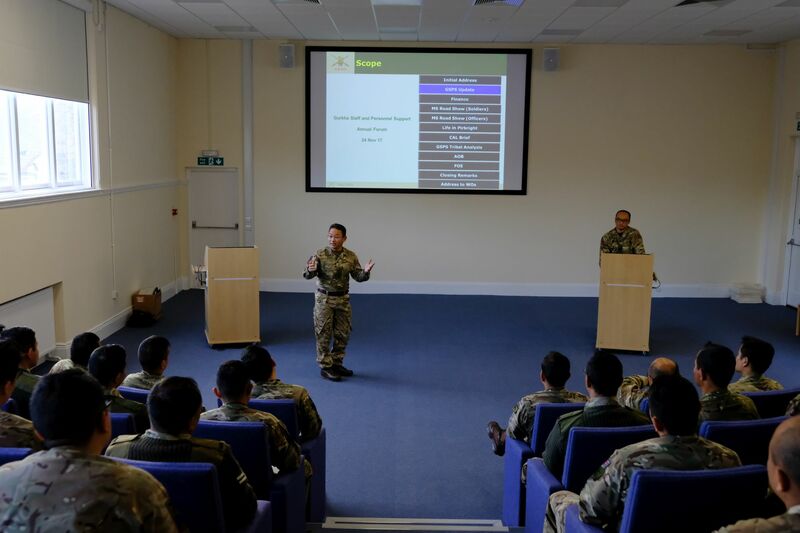 Presentations on the day included Manning roadshow, perspective of an Army Training Regiment Instructor by Corporal Nischal and a thought provoking discussion led by the Centre for Army Leadership Team to name few. 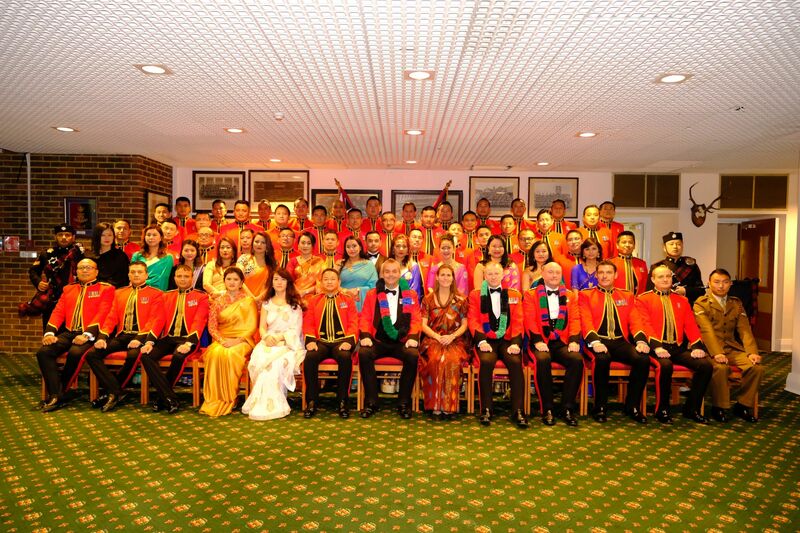 This was followed by the Annual Dinner Night for the GSPS Officers, Warrant Officers and Senior Non Commissioned Officers and their families and amongst the distinguished guests were; Colonel A D Griffiths OBE (Colonel of the Regiment Gurkha Staff and Personnel Support) and his wife Mrs Clare Griffiths, Head of the Staff and Personnel Support Branch – Colonel M Sykes, Colonel Brigade of Gurkhas – Colonel J Robinson, Commander SPS Regional Command – Lieutenant Colonel R Clarke Adjutant General Corps (SPS), SO2 SPS Officers APC – Major T McEvoy Adjutant Generals Corps (SPS). Apart from the delicious dinner prepared by the Queen’s Own Gurkha Logistic Regiment (QOGLR) Chefs and entertainment by the QOGLR Pipes & Drums and the GSPS Trio band; the Officer Commanding GSPS welcomed all distinguished guests and expressed his gratitude for the special support GSPS Company receives from this hierarchy. The evening bade farewell to Captain Kripalsen Limbu, Warrant Officer Class Two Sunil Rai and Warrant Officer Class Two Ram Gurung and their lovely families on their transfer to AGC(SPS). A special farewell on retirement was said to Warrant Officer Class Two Kritiman Baraili and his family, he proceeds on discharge on completion of his 22 years of exemplary colour service. We wish them all the very best success in their new ventures. Later, Colonel AD Griffiths OBE spoke about the GSPS achievements, highlights and expressed his delight that every member whole heartedly believed in the GSPS Ethos. With effect from this year Colonel of the Regiment GSPS kindly introduced ‘GSPS Soldier of the Year’ Trophy which recognises the outstanding achievement by the GSPS soldiers. It underpins the commitment and drive to be the best in all we do. At the inception of the award, it was also decided that the recipient of this prestigious award will be invited every year to the dinner night as a privilege, and in order to inspire others (Corporals and below). GSPS Soldier of the Year 2017 award was presented by the Colonel A D Griffiths OBE to Lance Corporal Biraj Thapa. Lance Corporal Biraj has consistently applied four strands of our ethos and gone a little bit further. A big congratulations to him. Finally, a massive thank you to the Regimental Headquarters GSPS for hosting and the Headquarters Brigade of Gurkhas for supporting the event.